This will be the first in a series of short articles about the effects of the 2017 Tax Act on individuals. 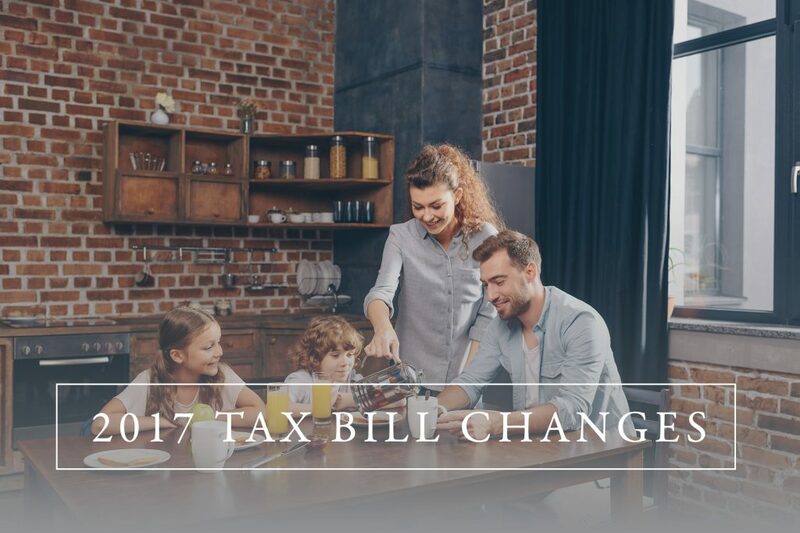 In addition to some sweeping changes in the taxation of businesses, last year’s tax bill made numerous changes, some beneficial and some not beneficial, to the taxation of individuals. The changes to the standard deductions have a significant impact on simplifying the tax returns for millions of taxpayers. The standard deduction is the amount that can be taken in lieu of itemizing personal deductions. If amounts paid for things like mortgage interest, charitable deductions, etc. fall below the standard deduction in any given year, the taxpayer will choose to use the standard deduction. Raising the standard deduction has the effect of allowing taxpayers to avoid keeping track of itemized deductions and simply claiming the standard deduction. 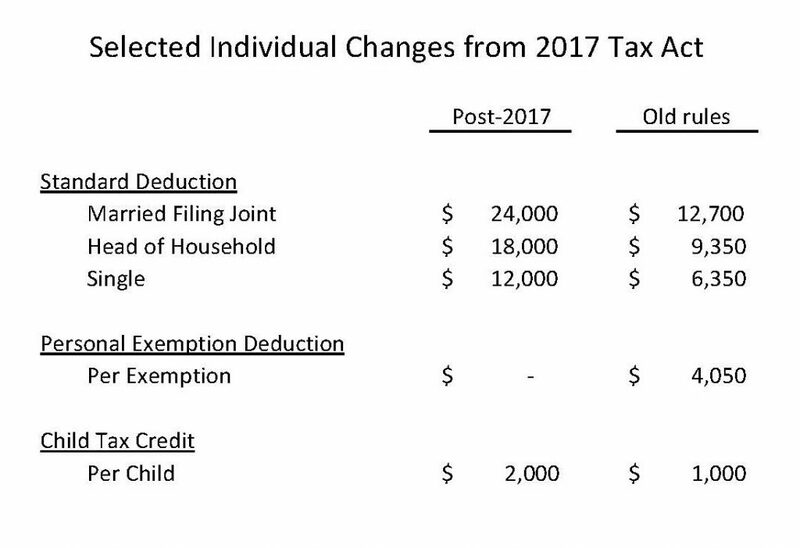 As you can see from the chart, the standard deductions are nearly doubled for years after 2017 (one caveat – most of the changes in the 2017 tax bill are scheduled to sunset after 2025). 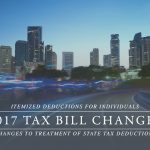 The allowable deduction for personal exemptions was eliminated entirely for years after 2017, although this effect is mitigated by the significant increase in the tax credit available under the Child Tax Credit rules (see below). Keep in mind that the personal exemption was a deduction and not a credit, thus the actual cash value to the taxpayer of the personal exemption was the personal exemption amount multiplied by that year’s marginal tax rate for the taxpayer. Example, for a single person in the 15% tax bracket, the value of the personal exemption was $4,050 times 15% or about $608. The Child Tax Credit was increased from $1,000 per eligible child to $2,000 for years after 2017. As mentioned above, this is a direct tax credit and not a deduction, so the $1,000 increase in the credit actually means a full $1,000 decrease in the tax liability of the taxpayer. 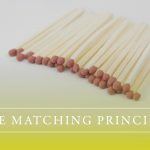 There are numerous articles you’ll find around the web with examples for various family scenarios plus a few online calculators where you can plug in your own facts to see roughly how the changes will impact you. How Long Should I Retain Records?